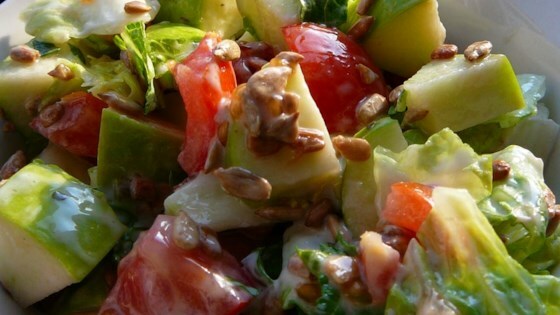 "This sour apple salad is both nutritious and delicious - it contains fruit, vegetables and seeds. You can use any type of dressing and lettuce in this recipe." instead of using a ranch dressing i made a vinegarette dressing... it was awesome!! My daughter enjoys "pretty" foods. I prepared this for her birthday dinner. Not only did it look beautiful in the glass salad bowl for her, but everyone else loved it too! I enjoyed this dish, and found the recipe quick and simple, and made from ingredients I already on hand. This had to many conflicting tastes. It just wasn't for me. Surprisingly good. Followed this to a tee. Used a deli- barrel pickle. Very good tasting. Everyone at the party liked it. This was surprisingly good! I tried it not knowing if i'd like it all of the flavors combined, but it was quite tasty! This salad was just ok for us. Liked everything in it - but it wasn't anything special. Sorry.